Info for Japan Visits | Eolas Biosciences Co. Ltd.
As part of our business development support we organize roadshows and other business trips to Japan for our overseas partners. The information below addresses some of the frequently asked questions we receive about travelling in Japan and interacting with Japanese companies. You can click on the topic links below to jump to the relevant information. Japan has a single time zone which is constant throughout the year. The time difference with Europe, the US and other regions changes as they adjust to daylight savings time etc. The length of day is relatively constant between the seasons; in Tokyo sunset is around 5pm in mid-winter and 8pm in mid-summer. The two main airports for international business travel are Narita International Airport (IATA code: NRT) and Tokyo International Airport, more commonly referred to as Haneda Airport (IATA code: HND). Both are more or less equally convenient for travel into central Tokyo. Kansai International Airport (IATA code: KIX) in the Osaka region can also be used depending on the domestic travel schedule. However, arriving into or departing from Kansai Airport as opposed to Narita or Haneda Airports has a very significant impact on domestic travel logistics, so if you are considering using Kansai Airport please discuss with us beforehand. Until recently, Japan has been a cash-based society, and there are still many situations (e.g. some restaurants, shops and taxis) where a credit card cannot be used for payment. It is therefore necessary to bring a certain amount of cash for your visit. Be advised that overseas visitors frequently experience difficulties using their credit cards (e.g. cannot be used or the payment amounts are limited), even if they have checked with their credit card companies beforehand. In particular, it can be very difficult to find ATMs accepting non-Japanese credit or bank cards, especially outside of the major cities. Foreign currency can often be exchanged at larger hotels, although the rate tends to be not very good. Tipping is non-existent in Japan, and may well be considered demeaning so do not attempt it. Even taxi drivers will scrupulously insist on returning the exact amount of change. We can arrange hotel accommodation in accordance with your budget needs. The most convenient hotel(s) for travel will depend on the location and order of companies to be visited. It is important to realize that due to the large size of cities such as Tokyo, the location of the hotel can have a huge impact on travelling efficiency. Although we do our best to avoid it, the travel schedule sometimes makes it necessary to use multiple hotels. Rooms are supplied with toothpaste / toothbrushes, razor / shaving cream and hair dryers as standard. Irons / iron boards are available upon request to the front desk. Travel to and from meetings is mostly by train (including the “bullet train”), some taxi and occasionally plane. Japan has an extremely well-developed and reliable rail system both within large metropolitan areas and linking major population centers. For business meetings, it rarely makes sense to travel by car as distances and traffic conditions make it a significantly slower and less reliable mode of transport. Japan has a large variety of culinary choices and by all accounts the quality is excellent. Many restaurants do not have Western cutlery so if you are not used to eating with chopsticks it is advisable to develop some proficiency before you arrive. Please let us know in advance of any dietary restrictions. For example, Japan is a difficult country for strict vegetarians to travel in, and planning will be required. Hygiene standards are very high and tap water is safe to drink anywhere, including hotels, restaurants and public places. The standard electrical supply is 100 Volts. There is a Hertz difference between East and West Japan (50 vs. 60 Hz) but in practice it is not of much significance. Overseas laptops, tablets and smartphones work fine on the Japanese electrical supply system. 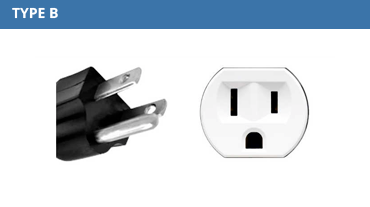 Plugs / sockets are mostly Type A with the occasional Type B (see below). Type A plugs and Type B sockets are compatible. 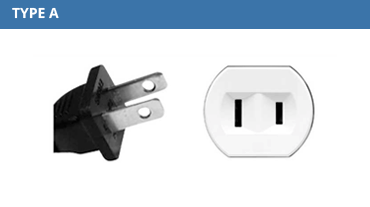 Type A plug variations where one pin is larger than the other also exist but usability is the same. Hotels usually offer a good (and often free) Wi-Fi service. Judging from visitor’s comments over the years, mobile internet connectivity is significantly less widespread than in the US and Europe, even in metropolitan areas. You can always connect to the internet via cellular networks, but naturally this will incur costs. Japan is a very safe country to travel in. Cultural norms and strict enforcement of laws on illegal firearms, weapons and drugs mean that the biggest threat to physical safety is probably traffic accidents. Although crime levels are very low, that does not mean non-existent, and as with anywhere unfamiliar it is always prudent to stay alert. Hygiene standards are very high and there are few endemic diseases. A high level of medical care is available almost everywhere, although it can be very expensive if you are outside of the Japanese healthcare system. It is advised to obtain travel health insurance before departing and bring prescription medicines if needed. As a seismically active country, small tremors happen all the time. Typically, the room will shake and creak for a few seconds and then it will be over. Outdoors, it might not be noticed at all. Such small earthquakes are relatively frequent (e.g. several times per month). Japan has some of the most rigorous earthquake building standards in the world and modern buildings (post 1981) are designed to withstand even a very large earthquake. In the unlikely event of a major earthquake, hotels etc. have a legally-required and well-rehearsed plan of action, so you will be in good hands. Japanese business culture is unique and the Japanese place a high level of value on etiquette and protocol during any type of business interaction. There is a myriad of unwritten rules of conduct that can take years to learn. However, Japanese hosts are generally quite forgiving to overseas visitors as long as they show respect and attempt to go along with how things are done. A little effort will go a long way. Despite its unique features, Japan’s business culture is grounded in the universal traits of politeness, sensitivity and good manners, so you are already familiar with some of its key elements. For men, we recommend a suit and necktie. For ladies, conservative business attire such as that worn in the US and Europe is fine. Although some Japanese pharma companies nowadays allow their employees to attend on-site meetings in more casual clothing, you are usually trying to sell them something so it behooves you to dress more formally. Very senior managers almost invariably wear a suit and necktie, and it may be considered somewhat disrespectful if you are not dressed to match. There is no downside to dressing on the formal side. Never wear a black tie as these are only worn at funerals. Light clothing is needed during the summer due to the heat and humidity. Be sure to wear good socks with no holes in them. There is a fair chance you will have to remove your footwear several times during the trip e.g. at client research institutes or at restaurants. Although obvious to most people, you need to be well groomed. Would-be sellers presenting themselves in a disheveled state are regarded negatively by Japanese clients, no matter how interesting or compelling the information they offer. Naturally, this does not optimize the opportunity to build trust or win business. Many Japanese pharma companies require employees at research institutes and other facilities to wear working uniforms. Do not make the mistake of thinking that everyone wearing such a uniform is a lower-level employee; the most senior managers at such facilities often wear exactly the same uniform. As a rule of thumb, keep the length of presentations to 25 minutes or less. Any more than this and your audience will become tired and lose concentration from trying to follow the English. Speak slowly, pronounce clearly and explain your points in a simple way. Avoid idiomatic expressions or jokes, which will likely not be understood. Keep your overall story simple and to the point; going off on a tangent or into a sub-story tends to confuse a lot of people. When a question is asked, respond with the conclusion first (“yes”, “no” etc.). Then explain the background or supporting information as appropriate. The other way around does not work well. Try to avoid presentation slides with copious amounts of text. Insofar as is possible, explain the key points using diagrams, figures and images to aid understanding with less reliance on words. Summary slides are always appreciated. Incorporate a short mental break or two into presentations e.g. by talking a bit about notable features of the region or city your company operates from, or just stopping and asking if everything is clear, or if there are any questions etc. There tends to be significantly less “brainstorming” and interactive discussions than with US / European audiences, unless there is a very specific topic at hand that needs to be discussed. For a first-time visit, the basic attitude is that you are there to explain your offerings in detail so that they can then judge whether it might be useful to them or not. Japanese audiences are highly fact-driven, so make sure that all assertions are backed up by hard data to prove the point. Subjective statements such as “our scientists are very experienced” or “the quality of our services is the best in the industry” etc. do not make much impact. Without the supporting information, such statements will be perceived as empty bragging. Avoid making derogatory comments about competitors. This will have the effect of lessening your own credibility. In general, Japanese people are very courteous, sensitive towards others and self-effacing. The following describes some common behaviors that may be useful to keep in mind in interacting with a Japanese company. Your meeting counterparts will tend not to interrupt you, saving their questions until after you are finished speaking. This is rooted in a desire to avoid discourtesy and often, insecurity with using English. So just because the audience is silent and questions are not being asked during a presentation does not necessarily mean they are not interested. During discussions, people sometimes smile, nod politely and even say “yes” as if they had understood, even if they have no idea of what you are saying. This is often to avoid losing face in front of their group and / or boss. Japanese people will always try to avoid saying anything negative, especially if you have traveled all the way from abroad to visit their company. This can make it difficult to gauge true interest, so be careful to not to read too much into seeming enthusiasm and positive-sounding statements. Japanese take meticulous notes and you will be quoted verbatim even years later. Given this, you should be careful not to make off-the-cuff promises or impart inaccurate information. Some of your audience may close their eyes, especially towards the end of a presentation. Usually, this means they are getting tired and trying to concentrate on the English, and does not indicate disinterest. Having said that, you will occasionally observe people fall outright asleep during meetings. It is not unusual and tolerated in Japanese business culture. The sleepers are unlikely to be key people for your purposes, so just ignore it and just keep going. Perceived pushiness is intensely disliked. Do not ask too aggressively about their internal situation; this will be seen as overly invasive or even infringing on their secret information. Likewise, do not try to pin someone down to a commitment. Long silences in the discussion as everyone mulls things over are very common. Don’t feel you need to fill the gap by saying something. Bring sufficient stock. Assume 5-10 cards per meeting for a first time visit to a pharma company. It is not necessary to have one side translated into Japanese. However, if you really want to, please check the translation with us before getting them printed. Be sure to have a proper business card case. Producing business cards from your pocket, wallet or notebook will be perceived as rather crass. The exchange of cards takes place before a meeting. Typically, the highest ranking people exchange cards first, followed by the rest in order of seniority. Generally, the visitor should offer his or her card first. Cards should be offered with both hands while stating your name, position / role and company, with the card turned towards the receiver. Proffered cards should also be received with both hands. However, a less formal exchange of cards can also occur where you offer your card in your right hand while your left hand simultaneously receives your opposite’s card. It is important to treat received cards with respect. Whatever you do, do not write on the card or fold it. During the meeting the cards you receive should be neatly arranged in front of you. After the meeting, received cards should be placed into your card holder, not your pocket. It helps to be proficient at using chopsticks before you arrive, as many, or even most restaurants do not have Western cutlery. Never pour your own drink, but reciprocate when someone tops up your glass. Seating order is arranged based on seniority, but it will be arranged for you, so no need to worry about it. Attire tends to be less formal than for meetings, but depends on the circumstances. Dinners are occasionally followed by a visit to a karaoke joint. Beatles numbers are suggested as they are always available, relatively simple and many Japanese know them too. Bowing between Japanese people has its own intricate set of rules. However, as an overseas visitor you will not be expected to bow; everyone will offer you their hand to shake. Do not read too much into a tepid handshake as most people are not used to it. Gifts are appropriate only after a relationship has been established, so there is no need for gifts on a first time visit. When you do give gifts, items from your home country are best, and ideally should be something that everyone in the group can share. For example, if you are coming from Scotland, a bottle of quality scotch whiskey would be a good choice. Presenting individual gifts to senior managers can be considered on a case-by-case basis. All gifts should be wrapped.